Cameron Ainsworth is an assistant professor at the University of South Florida. His work explores the interactions between human beings and marine ecosystems. His current research interests focus on estimating impacts from the Deepwater Horizon oil spill in the Gulf of Mexico and developing ecosystem-based fisheries management strategies and tools. Raymond Cormier is of aboriginal descent from the Splatsin band of the Secwepemc Nation located in the British Columbia southern interior. He has held a position in the Splatsin Title and Rights Department since 2008 and has been its director since 2010. His background is in natural resource management and Secwepemc history and culture. Robert G. McCandless began his professional career in oil and gas exploration before changing to mineral exploration in 1966. For two years while living in the Yukon, he worked as a contract researcher, which led to his publishing Yukon Wildlife: A Social History (University of Alberta Press, 1985). Prior to his retirement in 2009, he worked for 28 years with Environment Canada, mainly on environmental issues in the mining sector, but he also advised for several years on Aboriginal affairs including treaty negotiations. In 2013, he wrote an essay for BC Studies (no. 178, summer 2013) on BC offshore petroleum exploration leading to the imposition in 1972 of the current “moratorium.” A resident of Delta, he continues research and writing on history topics. Thomas McIlwraith is an assistant professor at the University of Guelph. His interests include British Columbia ethnography and In- digenous land use. He has worked as a consulting anthropologist since 1997 and has held post-secondary teaching and research positions since 2003. Catherine Murray is a professor in the School of Communication, and Associate Faculty, Gender, Sexuality, and Women’s Studies at Simon Fraser University. Dr. Murray studies cultural diversity, urban cultural governance, and the politics of culture. 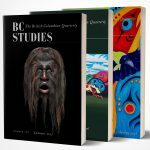 Patricia E. Roy, a professor emeritus of History at the University of Victoria, has contributed a number of articles to BC Studies over the years. She has written extensively on the Chinese and Japanese in British Columbia, but her most recent book is Boundless Optimism: Richard McBride’s British Columbia(UBC Press, 2012).